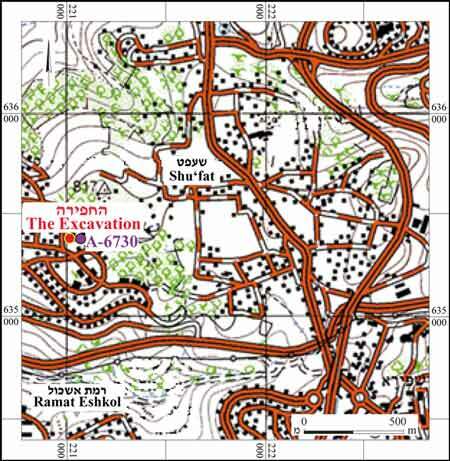 During July–August 2007, a salvage excavation was conducted in the Ramat Shelomo neighborhood on Shu‘fat ridge in Jerusalem (Permit No. A-5204; map ref. 22113–8/63550–2; Fig. 1), prior to construction. 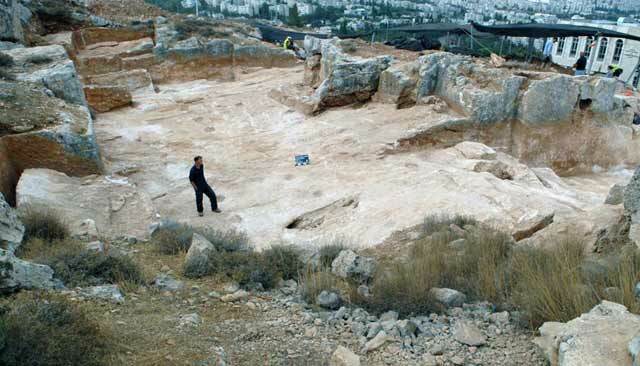 The excavation, undertaken on behalf of the Israel Antiquities Authority and financed by the Jerusalem municipality, was directed by I. Zilberbod with the assistance of A. Nesher (area supervision), D. Levi, A. Nesher and N. Sa‘id-Agha (inspection and exposure), R. Abu Halaf and Y. Ohayon (administration), V. Essman, M. Kipnis and E. Belashov (surveying and drafting ), M. Kunin (field sketches), T. Sagiv (field photography), Sky View Company (aerial photography) and D.T. Ariel (numismatics). A large quarry (Figs. 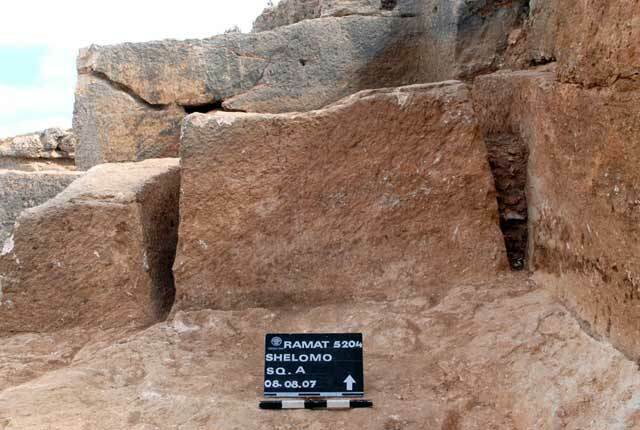 2–4), whose remains were clearly visible and was previously documented in the Survey of Jerusalem (Kloner 2001:49, Site 116; Sionet al. 2011:39–48), was exposed. Like other quarries, the enormous area of this quarry was divided into ‘courtyards’. 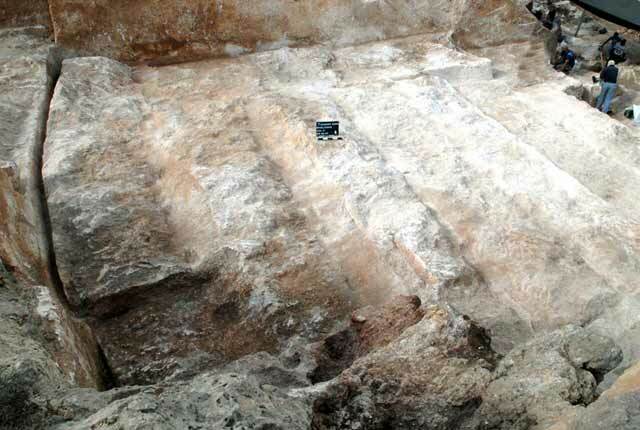 The excavation, covering approximately a third of the quarry, exposed five such courtyards (Areas A–E). Area A (Fig. 5). 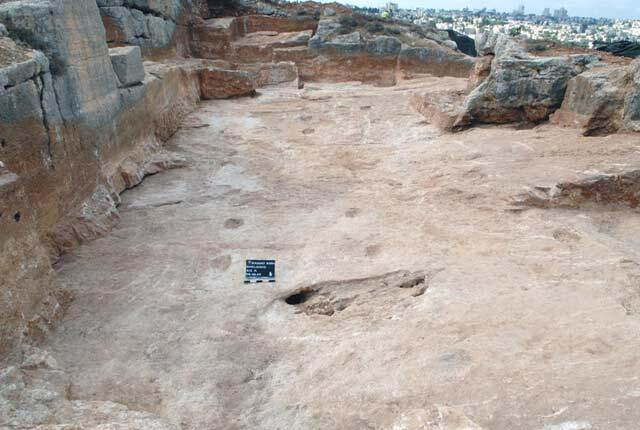 A rock-cut courtyard (13 × 30 m, max. height 5 m) was exposed in the eastern part of the site. Three–four quarrying steps (height 1–2 m) were discerned in the courtyard’s eastern and southern walls, where the negatives of large stones that had been quarried and removed (L100–L102; c. 2.5 × 4.5, height 1.6 m) and stones that remained attached to the bedrock (Fig. 6) were preserved. Long quarrying channels (L104, L105; length 3–10 m, width 0.10–0.25 m, depth c. 0.15 m) were also identified. Numerous depressions (0.3 × 0.3 m, depth c. 10 cm; Fig. 7) were hewn in the floor of the quarry at the center of the courtyard (L107). The southern depressions (92–109) were arranged in rows and at regular intervals, whereas the northern ones (110–119) were less evenly dispersed. 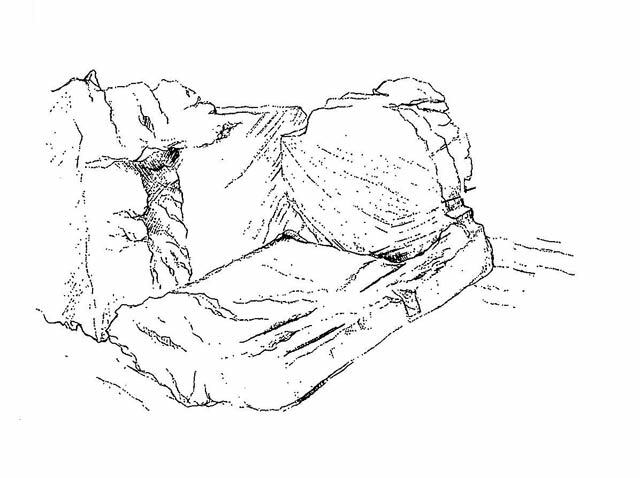 A rectangular, rock-hewn installation (L120; 3 × 4 m; Figs. 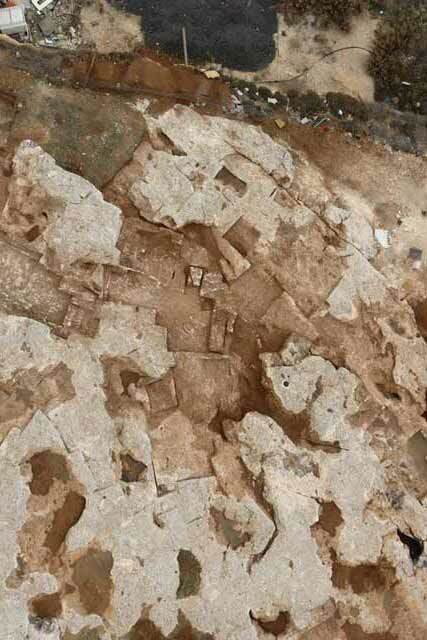 8, 9) was exposed in the western part of the area. Its northern and western walls were preserved to a height of c. 3 m, but its eastern wall survived to a height of c. 0.15 m only. Approximately 2.5 m to the north of this installation was another installation: a circular pit hewn in a karstic hollow (L121; diam. c. 1 m, depth 0.3 m; Fig. 10). The installations were probably used for storing water for use in the quarry. 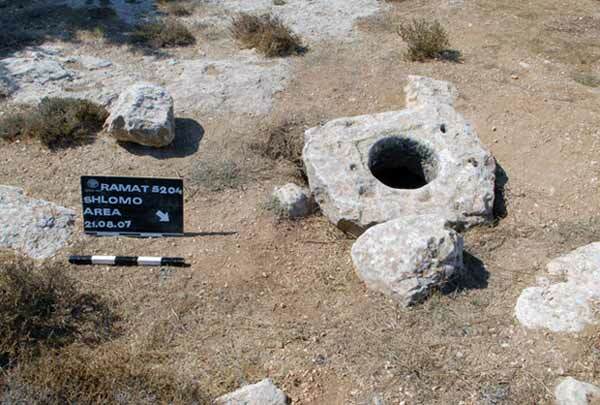 About 50 m south of the installations was a cistern, which was not excavated (Fig. 11). Area B (Fig. 12). The courtyard (c. 20 × 20 m), in the southern part of the area, extends over the upper, central level of the excavation. The negatives of large stones (L114, L116) and quarrying channels (L111, L113; length 4–10 m, width 0.1–0.3 m, max. depth c. 1.5 m; Fig. 13) were exposed. As in Area A, numerous depressions were hewn in the floor of the courtyard (L115): three arranged in a row (38–40), whereas the rest (41–87) were either single or in clusters. Natural bedrock with no signs of rock-cutting was exposed in the northern part of the area (L177). The large stones that were probably needed could not be quarried in this area, owing to the natural fissures in the bedrock. 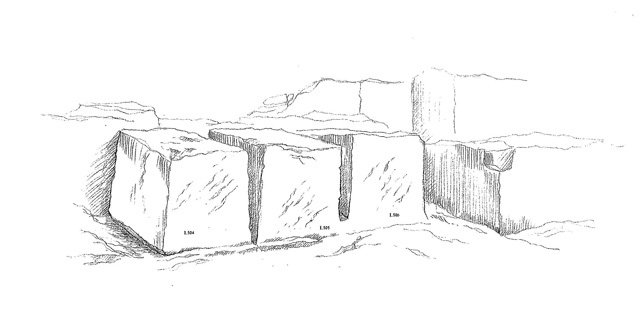 A wall built of small and medium-sized fieldstones (W1; length c. 6 m, width c. 1.1 m, height c. 0.5 m) founded on a soil fill (thickness 0.3 m) that covered the quarry in the northwestern part of the area. It seems that the wall postdates the quarry and was used as an animal enclosure. Area C (Figs. 14). 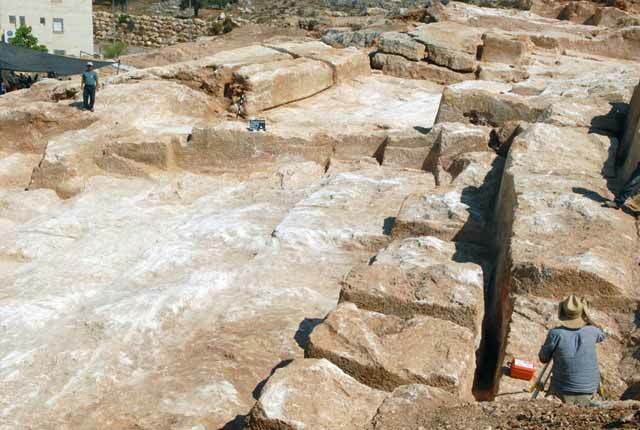 The longest stones quarried at the site (length c. 10 m, width 2.5 m) were discovered on the lower level of the excavated area, in the northwestern part of the excavation. Small depressions, some arranged in rows (121–126, 131–134, 160–163) and others scattered throughout the area in no particular order (127–130, 135–159), were also exposed. A typical sectional view of a site was exposed on the northern boundary of the area: diagonal quarrying lines (Fig. 3:5–5) and the quarrying phases in the area (Figs. 3:1–1; 15) were apparent. The lower level (max. 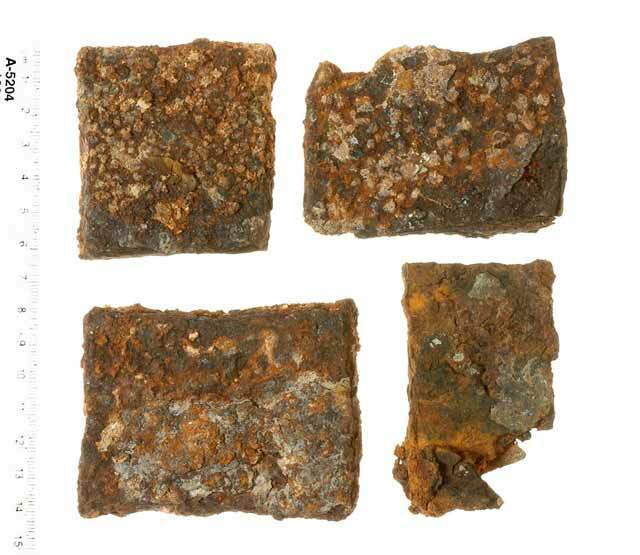 thickness c. 1 m) contained quarrying debris, including small stones (average size 0.25 × 0.30 m, largest size 0.4 × 0.5 m) and relatively large chips (5–10 cm). The upper layer (max. 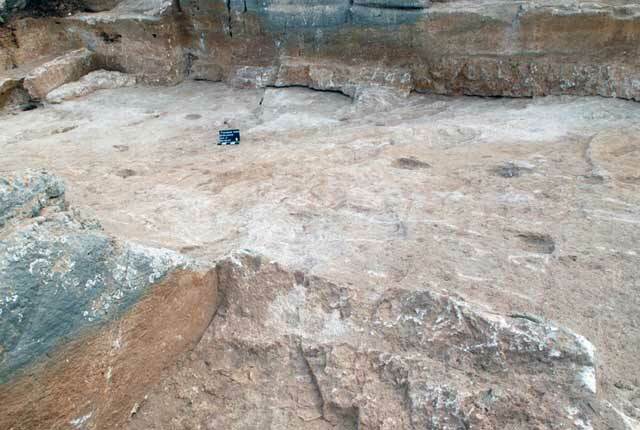 thickness 0.6 m)—mainly soil fill and small chips, devoid of stones—represents a phase when the quarrying work was halted at the bottom level of the quarry and continued on the higher quarrying steps. Area D (Figs. 16). This area was located along the quarry’s western boundary. Remains of five quarrying steps (Fig. 3:3–3; length c. 20 m, depth c. 5 m) were found in its eastern part. The western part of the courtyard was characterized by soft bedrock, and no quarrying remains were revealed there. Signs of a modern drilling rod (length c. 1 m, diam. c. 1.5 cm; Fig. 3:6–6) were found on the lower level of the area. Area E (Figs. 17). The area, along the southern boundary of the excavation area, comprised two main quarrying levels. The upper level (11 × 15 m) was similar in nature to the eastern part of Area A and the southern part of Area B. 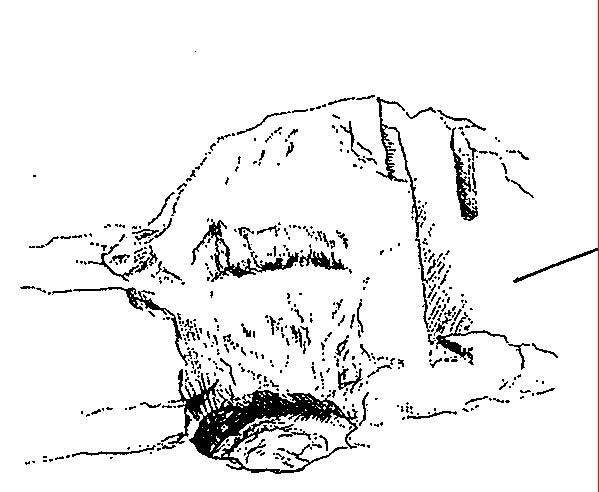 Long, large stones were quarried on the lower level (c. 14 × 20 m; Fig. 18), which was partially exposed and resembles Area C. Here too, as in other areas, were numerous hewn depressions in the floor; some were arranged in rows (8–20), but most of them were scattered (1–7, 21–37). 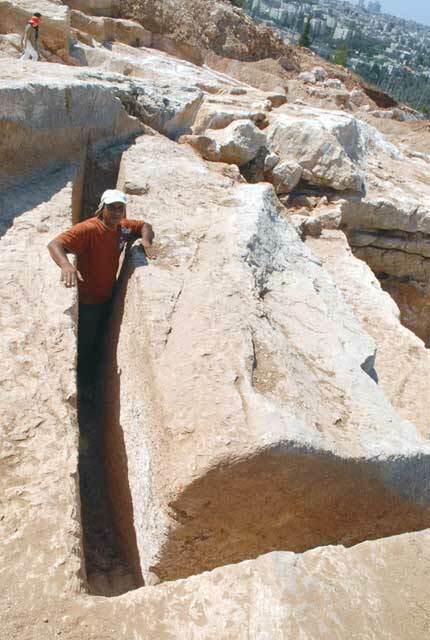 A bedrock bloc divided into three large stones (L504–506; average size 1.2 × 2.5 × 1.5 m; Figs. 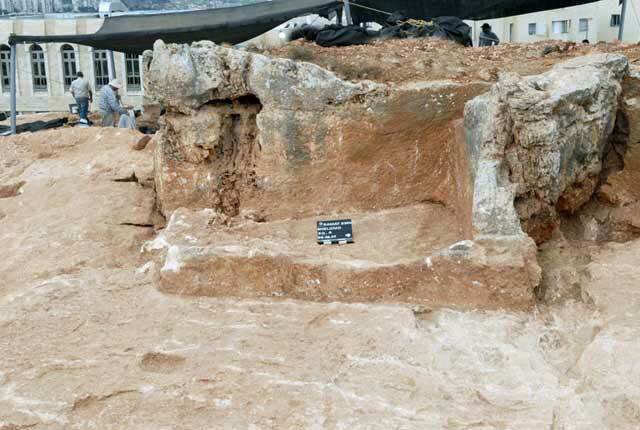 19, 20) was exposed on the border between the two levels. Severance channels that were as deep as far as the base of the stones; it is unclear why the quarrying was halted, since no cracks or signs of disintegration were noted on the stones. The work performed in the quarry relied on a variety of metal tools, some of which were discovered in the excavation. 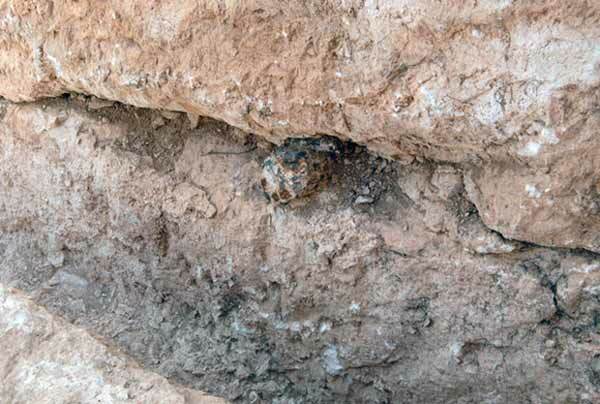 An abandoned, partially quarried stone (L109; 1.4 × 0.3 × 1.0 m) was found in the passageway between Areas A and C. The stone was not detached, probably because a crack compromised its quality and size. A wedge (Figs. 21, 22) was discovered between two metal plates in the severance channel. Another wedge, similar in shape but smaller and wider, was found among the quarrying chips. Small metal plates (length 5.5–8.0 cm, width 4–6 cm, thickness c. 0.5 cm, 124–455 grams; Fig. 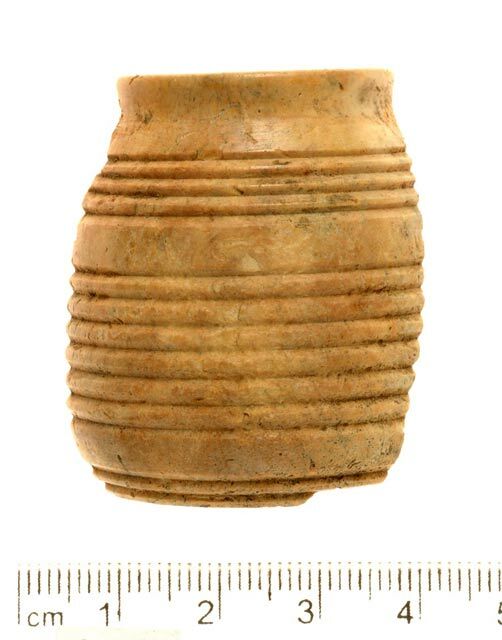 23) were found in Areas A and C.
Several jar fragments dating to the Early Roman period were discovered. 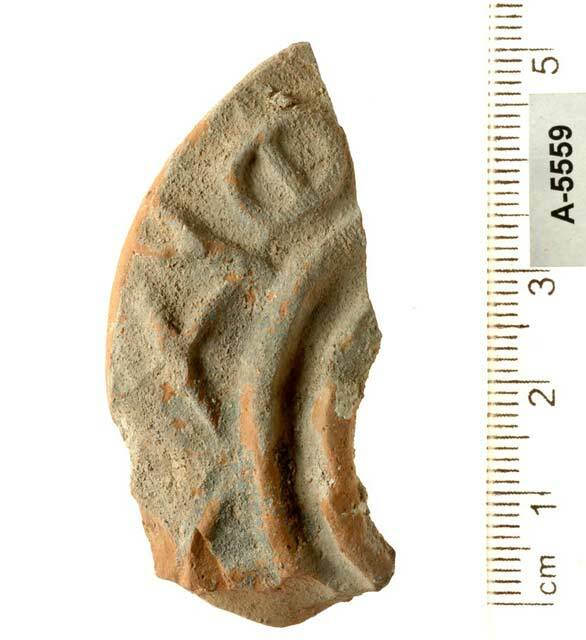 A fragment of a Late Byzantine-period candlestick lamp bearing an inscription (Fig. 24) and a bone item (Fig. 25) were discovered on a natural bedrock surface (L177) north of Wall 1. Three coins were also discovered, all from the time of the procurators in Judea under the Julian emperors. One (IAA 115276), found in a long quarrying channel (L105), was minted in the name of Augustus in 8/9 CE. The other two coins, found in Area C, were minted in the name of Tiberius in 30/31 CE (IAA 115277) and in 31/32 CE (IAA 115278). The coins, found on the floors of quarrying channels, indicate when the channels went out of use. 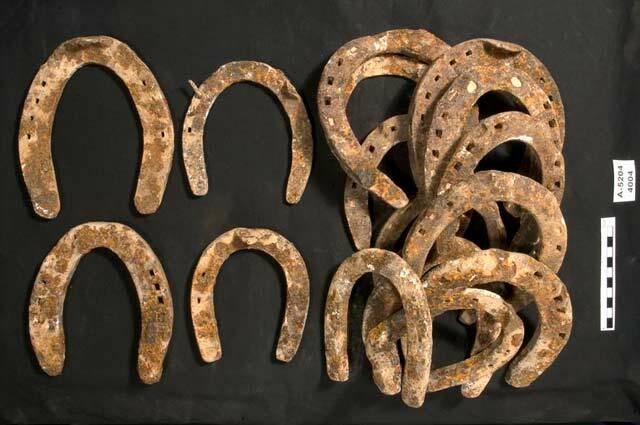 In addition, seventeen metal horseshoes, some still with nails in them (Fig. 26), were discovered in Area D; they apparently date to the modern era. 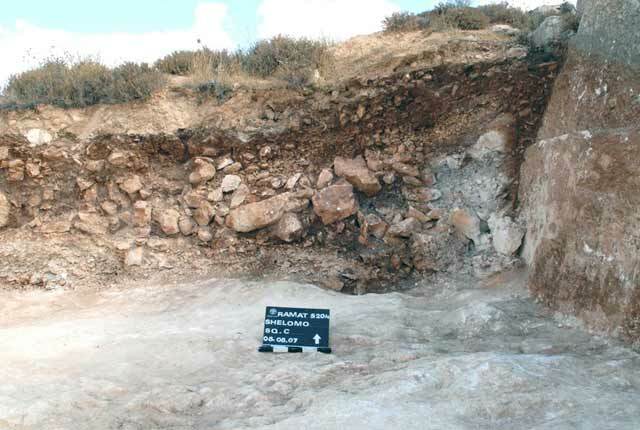 This excavation yielded for the first time an extensive area of an ancient quarry, in which almost all of the elements characteristic of an ancient quarry were present: courtyards, where various-sized stones were quarried; ancillary installations; and small metal artifacts, parts of quarrying tools. 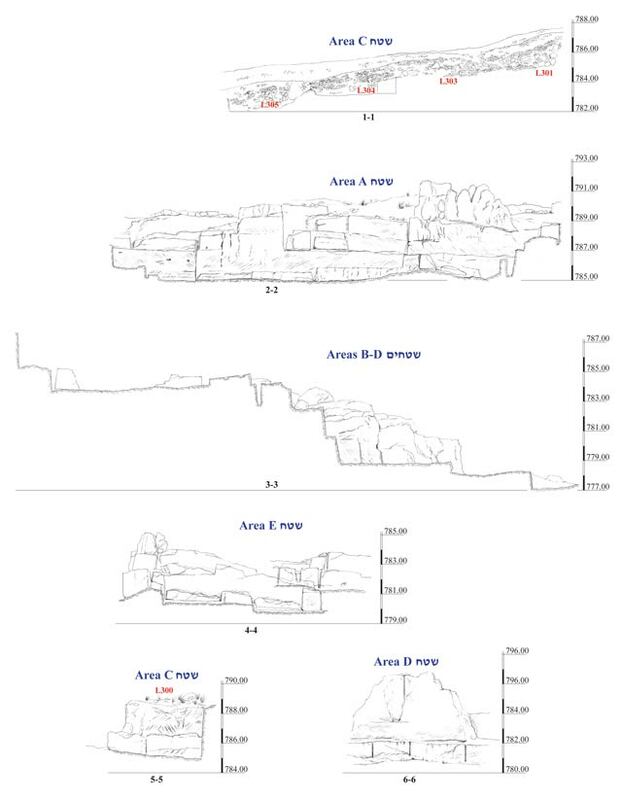 Over two hundred depressions were hewn in the five uncovered areas; their systematic arrangement suggests that they were used to secure wooden beams of stone-lifting devices. 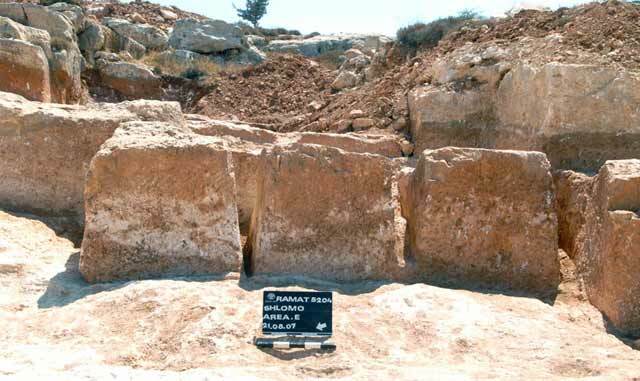 The type of rock, the size of the stones and the datable finds, all suggest that the quarry was used to produce large building stones for public buildings during the Second Temple period. 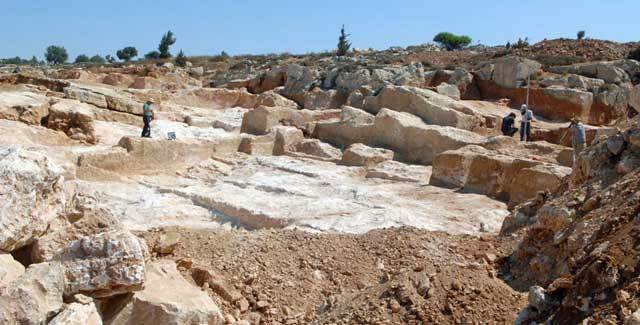 The finds from the Byzantine period probably indicate activity that postdated the quarry. Kloner A. 2001. 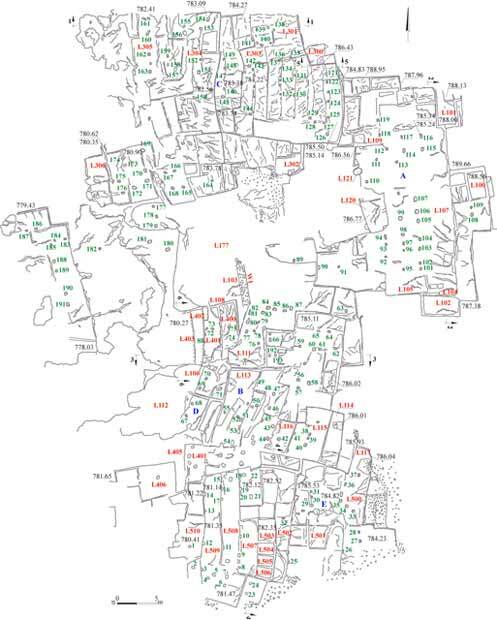 Survey of Jerusalem: The Northeastern Sector (Archaeological Survey of Israel). Jerusalem. Sion O., Sasson A., Zilberbod I. and Rapuano Y. 2011. 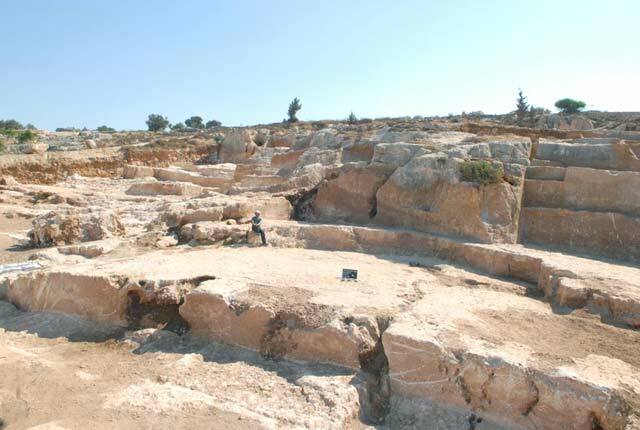 Quarries and Quarrying Methods in the Second Temple Period in the North of Jerusalem. Judea and Samaria Studies 20:39–48 (Hebrew). 4. The excavation area, general view looking north. 5. Area A, general view looking south. 6. Area A, undetached stones. 7. Area A, depressions in the quarry floor. 8. Area A, a rectangular installation. 9. Area A, a rectangular installation, looking west. 10. Area A, a circular installation. 11. Area A, cistern opening, looking southwest. 12. Area B, general view looking southeast. 13. Area B, deep quarrying channels. 14. Area C, general view looking south. 15. Area C, Section 1–1, looking north. 16. Area D, general view looking north. 17. Area E, general view looking north. 18. Area E, the lower level, looking northwest. 19. Area E, a stone bloc divided into three stones. 20. Area E, a stone bloc divided into three stones, looking west. 21. Area A, a wedge inside a severance channel. 24. A lamp fragment bearing an inscription.